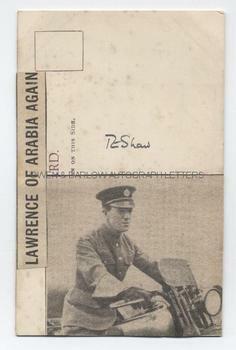 T. E. LAWRENCE Newsprint Portrait Signed. British (Welsh born of Anglo-Irish parents) soldier, writer and scholar. He played a key role in the WW1 Arab Revolt (1916-1918) and won immortality as the almost mythical "Lawrence of Arabia". Autograph Signature (signed as T.E. Shaw, a name he used when seeking anonymity after the war) above a newsprint photograph mounted on post-card. The portrait shows T .E. Lawrence in RAF uniform and astride his Brough Superior motorcycle, similar to the machine on which he was killed in 1935. Approx 5.5 x 3.5 inches. A few very light foxing spots, else fine. Thomas Edward Lawrence remains one of the great enigmas of 20th century history. Despite his immense fame, he shunned publicity or, perhaps more accurately, exposure to the public. He changed his name twice (firstly adopting the name Ross and then Shaw) in a bid to remain anonymous and keep the media at bay. He hardly ever responded to requests for his autograph and his signature on any item is rare. Signed portraits (even newsprint photographs such as this) are virtually unknown.